The Kieffer pear tree is an oriental fruit tree that is a hybrid between Chinese and European sand pear with large yellow fruit. They have white fleshy fruits which are crispy, juicy and with coarse texture. The tree normally bears the fruit in late September. They are hardy tree species, which tolerate hot climates. More than two trees should be planted in the same garden to ensure pollination. They are deciduous trees growing well in vast American climates. They normally produce fresh delicious, bright yellow pears for desserts, honey and preserves as well as for fresh eating. They have long life span and require little maintenance. This sturdy tree produces fruits while it is young. It is also blight resistant and can do well in various climate zones all the way from zone 4 through to zone 9. These fruits are normally picked when they are firm and yellow-green in color. The fruits are stored at 60-70 degrees Fahrenheit to allow pears to finish ripening. They are drought resistant. They require between 300 and 400 of chill hours. You can calculate the chill unit (CU) for your growing zone. 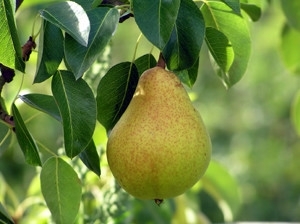 These pear trees produce heavy crops of large, yellow-golden fruits. They are vigorous and hardy and produce quality pears dependably for many years. They are good for baking, canning, preserves and honey. Although some species are self-fertile, others may require other trees for cross pollination depending on the climate. They are immune to blight and quite resistant to other ornamental fruit tree diseases. The Kieffer pear tree exhibits green, glossy leaves. That is why, they are exceptional landscape trees as well as flavorful, delicious fruits. The pears blossoms in the spring and ripens between October and November. The standard spread grows to 20’, dwarf grows to a 10' spread and semi-dwarf grows to 12'-15' in height. They have alternate leaves on the twig with fine teeth on the margin. Its fall color is often golden bronze.